On 23-24 November 2017, IGCAT participated in the kick-off meeting of FOODBIZ – University and business learning for new employability paths in food and gastronomy, a two-year project developed in the framework of Erasmus+ programme’s action Strategic Partnerships for Higher Education and aimed to boost smart and sustainable regional development. Based on cross-sectoral dialogue and placed at the exciting convergence of agriculture, food and tourism, the project is designed to enhance employability of higher-education students, and ultimately stimulate local job growth, by filling in the existing gap between academic skills acquired during their university studies and the actual needs of businesses and entrepreneurs that operate in local food and gastronomy markets. IGCAT Expert and Professor at the Department of Education, Cultural Heritage and Tourism of the University of Macerata (Italy), Alessio Cavicchi and his team coordinate the project which, besides IGCAT – represented at the meeting by Research Assistant, Fabrizia Toccoli – engages other six European partners: the University of Gothenburg (Sweden); the University of Economics and Business of Poznan (Poland); the Faculty of Tourism and Hospitality Management of the University of Rijeka (Croatia); the European Cultural Tourism Network (ECTN), based in Brussels; the Piceno Lab of the Mediterranean Diet (Italy); and the Svinesund Committee (Sweden). FOODBIZ targets higher-education students from the four participating universities who want to become professionals in the gastronomy field and is meant to equip them with soft skills, self-awareness, and sense of initiative to face the labour market successfully. Involved in experiential and problem-based learning activities such as workshops, conferences and focus groups, students will interact with local businesses in co-creation processes aimed at finding innovative solutions to existing problems affecting the local communities they belong to. Local public authorities will also be part of the equation and a final impact of the project is expected on regional smart specialisation strategies in terms of providing useful information for policy-making in the sectors concerned. 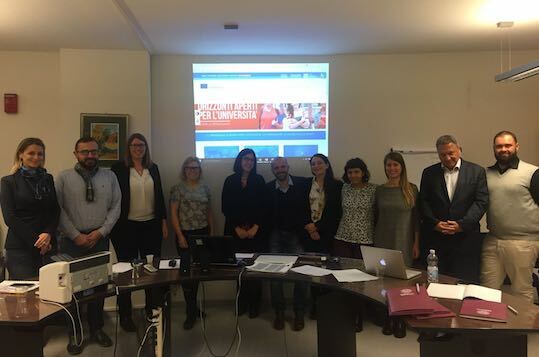 Held in the premises of the University of Macerata, the kick-off meeting laid the foundations for the collaboration of the FOODBIZ consortium partners, establishing a common methodology, specifying individual tasks, and defining initial objectives and milestones of the initiative. At the end of the project, all educational and training materials produced will be compiled and made available on an open source platform, alongside a how-to guide for implementing the FOODBIZ approach in further universities and related communities. The next partners’ meeting will be organised in Rijeka (Croatia) in May 2018, during the Training Week addressed to the staff of the universities involved and aimed to equip them with the knowledge and methodologies needed to carry out co-creation initiatives. IGCAT is a non-profit organisation established in 2012 working in the fields of gastronomy, culture, arts and tourism. Through its worldwide network of experts, IGCAT aims to empower local communities by guiding, facilitating, and supporting local leaders in cities, regions and cultural projects to understand the potential of their distinct food, culture, arts and sustainable tourism assets. IGCAT is furthermore the official secretariat for the Region of Gastronomy Platform and provides the European Region of Gastronomy Award, the European Young Chef Award and the Local Food Gift Award.